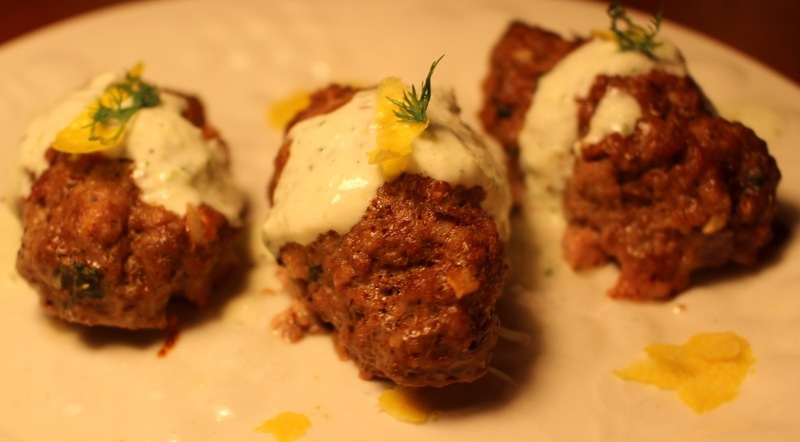 I used to get these awesome Greek Meatballs at one of my favorite restaurants. They call them Keftedes. That restaurant was always such a pain though. Many days they were closed due to another fire or they were remodeling again and they pretty much always had the worst service. Sometimes these tiny morsels weren't even available and I would find myself dreaming about them. This tastes very close to their version if not actually even better. These are healthy on any diet and at the same time they don't make you feel like you are on a diet. Peel cucumber with vegetable peeler down to seeds into a strainer, salt and let excess water drain off while you prepare the rest of the meal. Throw seeds of cucumber out. Let Meat sit until at room temperature. After meat has come to room temperature add to a medium sized bowl with grated red onion, egg, lemon, and the rest of the spices. In a blender or food processor combine the greek yogurt, fresh dill, cumin, cucumber, lemon, garlic, salt and pepper. Blend until smooth. I found this recipe searching for Greek Meatballs here This was the second time that we made this and this time we used less mint about half of what Rachel suggested but you might like more. We also used less milk this time for the bread using only 1/4 cup milk to soak it in and less meat just 1 pound instead of 1.5 pounds. Most of you will be really concerned about the use of the sourdough bread but we learn by way of the South Beach diet that the acidity in the sourdough actually makes it safe for our diet and will not cause our gi levels to rise enabling us to satisfy our need to eat great food while on the HCG diet as well as lose weight at the same time. Another thing to keep in mind is that it is a small amount of bread stretched throughout the entire recipe so don't let it worry you.